The Inside Baseball Coaches Clinic is hosting its annual 2017 event. Registration is open! We are featuring 17 renowned coaches (and growing) presenting over 60 powerful and insightful talks covering topics including in-game coaching, pitching, hitting, fielding, speed, arm care, functional strength, mental edge, and much more! CHERRY HILL, N.J. - Oct. 7, 2016 - PRLog -- The Inside Baseball Coaches Clinic is hosting its annual 2017 event from January 12 to 14, 2017. The 3 day event is conveniently held at the Crowne Plaza at 2349 West Marlton Pike in Cherry Hill, New Jersey, just 20 minutes from Philadelphia and 105 minutes from New York City. Our baseball clinic will feature presentations by the nation's top coaches and trainers that industry experts from Baseball America have called "some of the brightest minds in the game today." We are featuring 17 renowned coaches (and growing), presenting over 60 powerful and insightful talks covering topics including in-game coaching, pitching, hitting, fielding, speed, arm care, functional strength, mental edge, and much more. Registration is now open to high school coaches, assistant coaches, baseball players, as well as students under age 18. We also are offering exclusive Exhibitor and Sponsorship opportunities. The registration rate for coaches is $199.00. Players/students ages 10-18 can attend for $49.00 (rate does not change at the door). 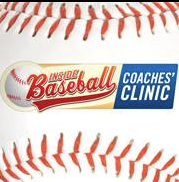 The Inside Baseball Coaches Clinic does not offer a one-day registration rate. Registration includes full access to the event for all three days as well as a complimentary lunch on Friday. For more information and to register for our event as an attendee or exhibitor, visit http://www.insidebaseballcoachesclinic.com or call (973) 921-0400.